Were There 6 Percent More Murders Last Year, Or 16 Percent? And will murder counts rise again this year? More Americans were murdered last year than in 2014, preliminary city and federal data suggests. That news alone is bad enough, but whether the increase was big or the biggest on record depends on whether you look at national data for half the year or full-year data for big cities — the meager choices available from the country’s patchwork crime statistics. Last week, the Federal Bureau of Investigation’s Uniform Crime Reporting program announced cumulative crime figures for the first six months of 20151 showing that murder was up 6.2 percent nationally. That’s a troubling rise in murders, which is closely watched by criminologists both because of the seriousness of the crime and because they believe official murder counts are closer to the real numbers, and harder to fudge, than data for other categories of crime. If the full-year rise for all agencies is as high as the preliminary half-year figures, it’d be the biggest increase in murders2 in a single year since murders rose by 9 percent in 1990. But it’s also less than half the increase in murders according to major city police departments that reported their own preliminary counts for 2015 earlier this month. Based on the latest available data from the 60 most populous cities in the country, total murders were up 16 percent — consistent with my September analysis of the data. A nationwide murder increase of 16 percent would be enormous — and unprecedented. The previous biggest increase in a single year since the start of the FBI data set was 13 percent, in 1968. Also, the FBI data itself indicates a disconnect between murder in cities and in the rest of the country. 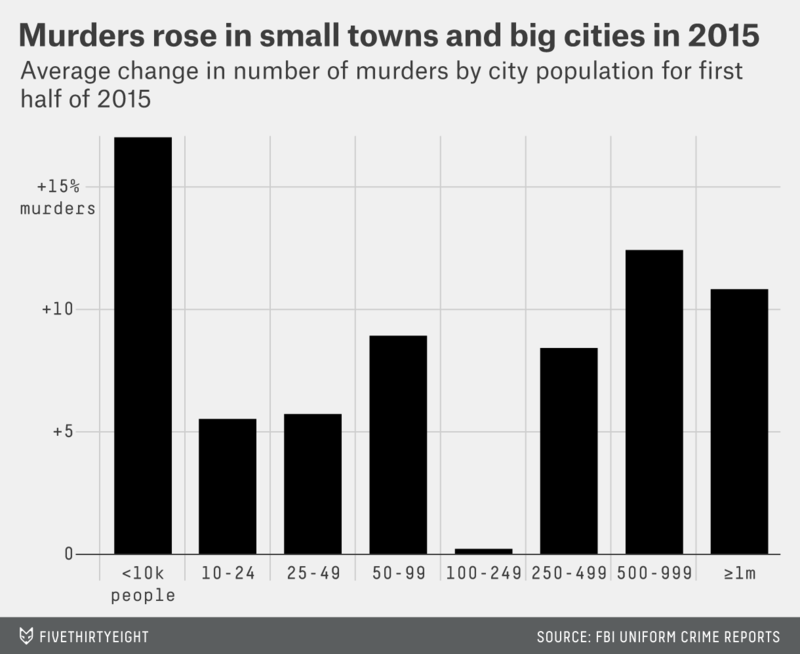 The FBI broke down its data by city size and found that murders in the first half of the year had increased by about twice the national rise in cities with 500,000 or more people, a category that includes more than half of the 60 biggest cities, and most of their murders. So if you’re using cities as proxies for national murder trends, those trends will look exaggerated. The biggest cities in the country consistently have been a good proxy for the direction, but not the magnitude, of murder trends. 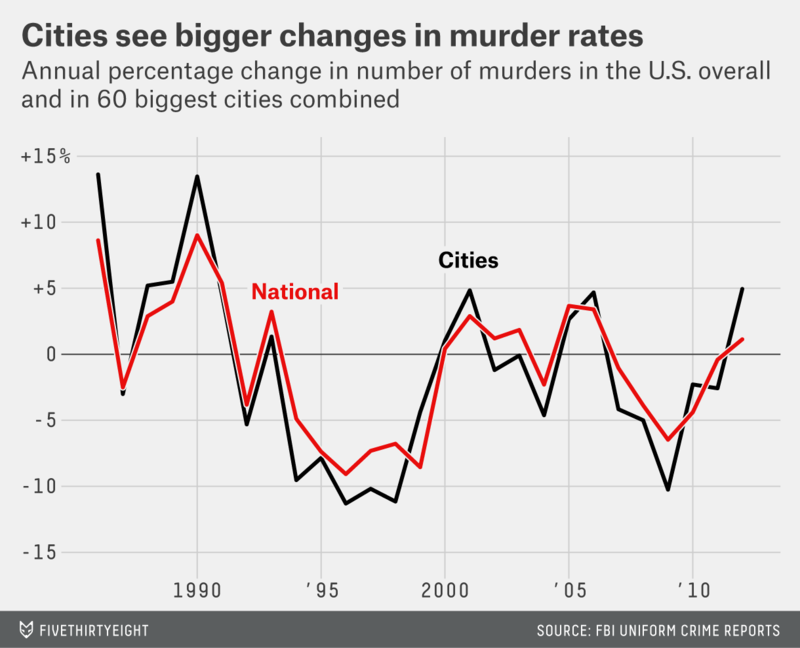 From 1986 to 2012, the annual change in the murder rate in the 60 biggest U.S. cities4 has been highly correlated5 with the change in the national murder rate. 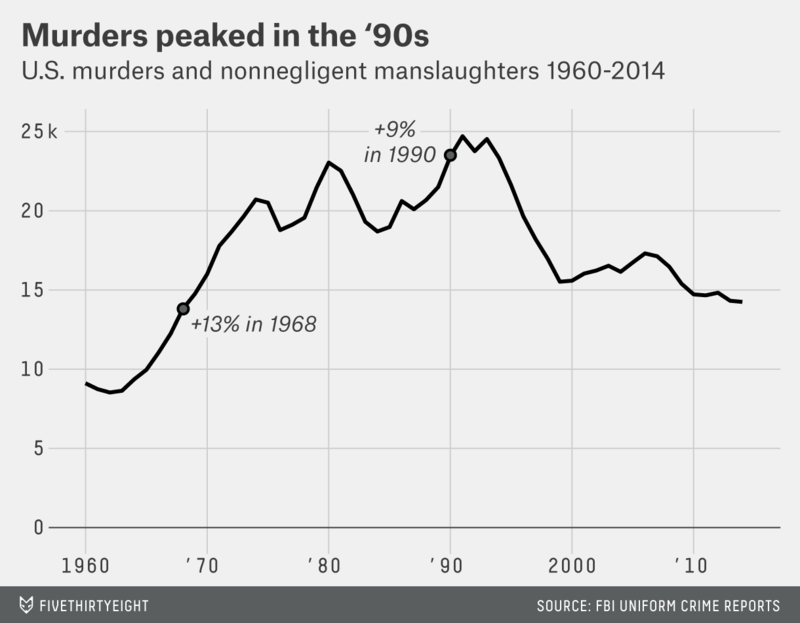 Just twice have murders declined in large cities when they increased nationally, or vice versa. But cities’ murder counts move more. On average, for every change of 3 percentage points in the number of murders in the U.S., the change in the number in the biggest cities was 5 percentage points. This makes sense. Big changes in murder rates in some of the biggest cities — because of a change in policing tactics or budgets, say, or an influx of weapons or gang- or drug-fueled violence — can pull the data sharply in either direction. Just the five biggest cities had half the number of murders in 2012 as the next 55 biggest cities. But the rest of the country is policed by more than 18,000 other departments covering places of different sizes, locations and characters. That sort of data set is likely to be more stable from year to year. Whatever the size of the increase in murders, any one murder is troubling and we may have had 1,000 more murders nationally last year than the year before.6 Even worse than one year of increasing murders is a series of increases like the ones between 1987 and 1991, which added up to a total increase in murders of 23 percent nationally during that period. It turns out, though, that there hasn’t been a strong pattern of increases one year continuing in the next year over the last 30 years.7 Since 1986, murders have continued to rise the year after an increase seven times, but six times they’ve fallen after an increase. So there’s no reason to assume last year’s increase in murders — whatever its magnitude — will continue this year. For the two-thirds of local police agencies that submitted comparable data for both the first six months of 2015 and the same period a year earlier. Technically, murders and nonnegligent manslaughters. Some cities report this data as “homicides” and others use the FBI definition of “murders and nonnegligent homicides,” which doesn’t count justifiable homicides and negligent manslaughters. For each city we were looking at the same data in 2015 and in the comparable period in 2014, which should pick up underlying changes no matter which definition the city used. Including only cities in each comparison for which there is data in the FBI database for both years. Which is what we’d expect if the national increase last year was 6.2 percent, the same as it was for the first six months. The R-squared of the relationship between the change in number of murders nationally one year and the change the next year was 0.43 from 1961 to 2014. However, it was just 0.26 from 1986 to 2014 nationally, and just 0.21 in the 60 biggest U.S. cities from 1986 to 2012.